The numbers are impressive: Eleven national championships (and counting). A staggering 40 conference championships. Three Heisman Trophy winners. Dozens of All-Americans. Countless statistical milestones. Nobody's done it better, or for longer, than the University of Michigan. But the numbers alone don't do justice to the impact that Michigan football has had and continues to have on its legion of fans. What takes place within the storied confines of Michigan Stadium is more than simply a game; it's a way of life. Wolverine legend Ron Kramer put it this way: "Even though the game has changed, there is a connection between all of the players and coaches though the years. Once you are a Wolverine, you are always a Wolverine." 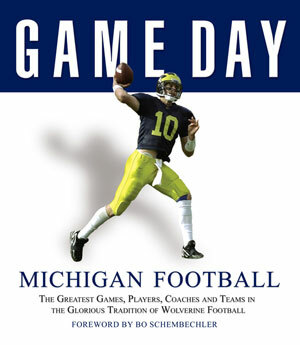 Game Day Michigan Football is a celebration of that bond shared by all Wolverines and their fans, and of the decades of gridiron excellence that have inspired it.